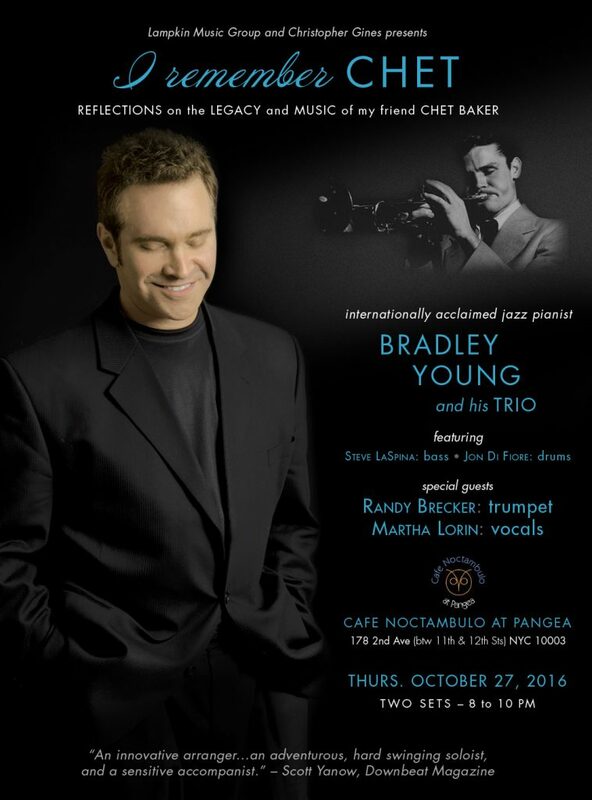 Internationally acclaimed jazz pianist and composer Bradley Young makes his New York City debut at Café Noctambulo at 8 pm on October 27th with a special tribute to the prolific trumpet genius and icon, Chet Baker. Presented by Lampkin Music Group and Christoper Gines, I Remember Chet: Reflections on the Legacy and Music of Chet Baker, also features trumpet and flugelhorn great Randy Brecker and renowned jazz singer, Martha Lorin. Also sharing the stage are Steve LaSpina on bass and Jon Di Fiore on drums. Young, who met Baker in Chicago in 1981, shared a personal and musical friendship with the singing trumpet master, which lasted until Baker’s untimely death in 1988. I Remember Chet is Young’s spoken, sung and played tribute to Baker, with whom he produced the album “Chet in Chicago.” According to Young, the show will be “a romantic and nostalgic look back at Baker’s life and legacy.” The group will perform songs from some of Chet’s most admired recordings, including many of his favorite standards from the Great American Songbook, including “My Funny Valentine,” “Old Devil Moon,” “How Deep is the Ocean” and more. Multiple Grammy Award-winner jazz trumpeter and composer Randy Brecker has been a musical force for more than four decades, playing trumpet and flugelhorn on hundreds of albums with a wide range of A-list performers. Based in the New York Metropolitan area, international jazz singer Martha Lorin continues her close collaborations with the best musicians in the business, garnering praise for the beauty of her voice and her exceptional way with a lyric. With a rhythm section that includes bassist Steve LaSpina and drummer Jon DiFiori, “I Remember Chet” will be a cool evening. I Remember Chet: Reflections on the Legacy and Music of Chet Baker plays at 8 pm on Thursday,October 27th at Café Noctambulo at Pangea, New York’s hot supper club, located at 178 2nd Ave. at 12th Street. There’s $20 music charge and $20 food/drink minimum. Call 212 – 955 – 0900 to make reservations. For further information, call Ralph Lampkin at Lampkin Music Group, 574-310-4047.